➤ Upon arrival you will be met and guided by our representative to the hotel for check in. Overnight stay at the hotel. ➤ After breakfast, you will proceed proceed on a sightseeing Tour of the Old and New Delhi. Places covered include the Rajghat, India Gate, Indian Parliament, Secretariat buildings, JAMA Masjid and the Lotus Shaped Temple. You will also see the Highest Stone Tower in India, Qutub Minar. ➤ After lunch proceed for the Bazaar Shopping Experience. Delhi is a fantastic place to shop. There's an astounding array of wonderful stuff : handicrafts, textiles, clothing, carpets, jewellery and a kaleidoscope of saris. The Bazaar's in Delhi estimate to have some 25,000 people within its confines at any given time and also attracts many foreign tourists. It is known as a place with the lowest prices. ➤ Evening depart for Agra. Upon arrival dinner and overnight at hotel. 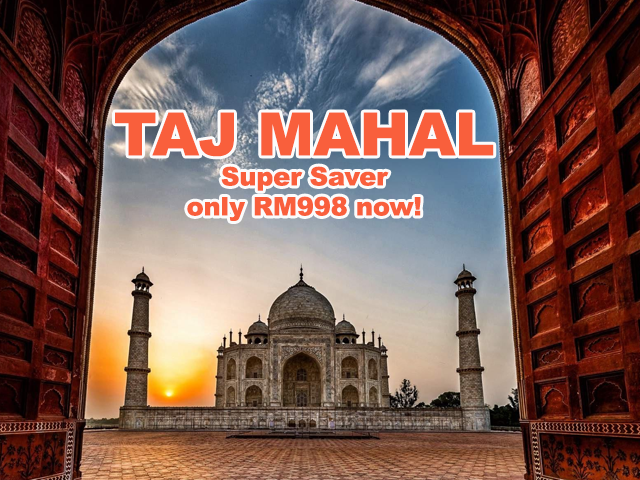 ➤ After breakfast, visit the world famous Monument of Love Taj Mahal (closed on Fridays) built by Mughal Emperor Shah Jahan in memory of his third wife, Mumtaz Mahal. He built it from white marble, often inlaid with gold or semi-precious gems. It took around 21 years for Shah Jahan to complete this monument. Taj Mahal is one of the 7 Wonders of the World and is also a UNESCO World Heritage site. ➤ After lunch at hotel,you will visit the historic Agra Fort. Agra Fort is a monument; also a UNESCO World Heritage site. It is just a few kilometers away from its more famous sister monument, the Taj Mahal. Realizing the importance of its central situation, Moghul Akbar made it his capital and arrived in Agra in 1558. Moghul Akbar is non other than the grandfather of the famous Emperor Shah Jahan. ➤ Evening shopping spree at Agra Bazaar. Later, you will have dinner at the hotel. ➤ After breakfast, free to explore Agra. After lunch, return back to Delhi. If time permits, you will be dropped off for Bazaar Shopping in New Delhi. ➤ Evening depart to airport for departure. ➤ p/s: if required we can leave Agra early in the morning if you wish to explore / go shopping in Delhi.